The Northern Country Region Track & Field Carnival will be held Sat 16 – Sun 17 Feb – 2019. Open to: U9 – U16 athletes. To be eligible to enter the Coles Region Track & Field Carnival, athletes must be registered and be a financial Little Athletics Victoria Competitive Member by the closing date and time for entries. They also must have competed in a minimum of 4 weeks of Centre competition by the close of entries. Only athletes who meet the qualifying requirements at the 2019 Coles Region Track & Field Carnival will be eligible to compete at the State Track & Field Championships. 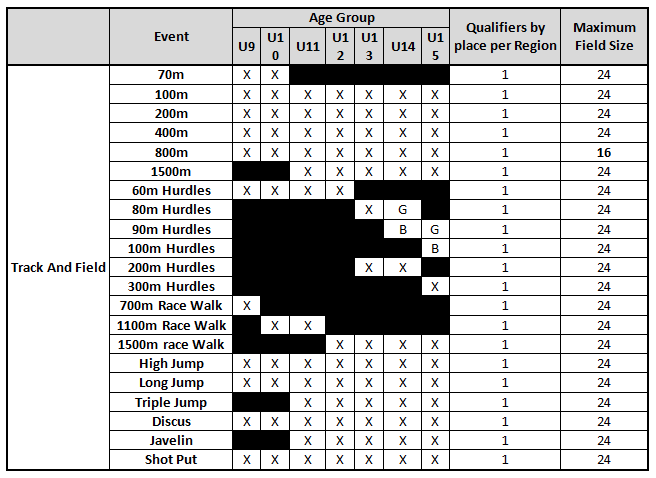 This table displays the events contested at the 2018/19 Coles Region and State Track & Field Championships and the number of qualifying positions available. Example: In the U9 Girls 100m, the first place from each of the 7 Regions then the next best 17 performances from all Regions will make up a field of 24 to qualify for the State Track & Field Championships. Note: 800m events will only be a field of 16.